Breaking News: The entry below is one of the 10 finalists in a coconut cooking challenge. The winner will be featured in San Francisco, USA. The winner is selected through online VOTING. This is the only Filipino entry so cast your Filipino VOTE now Here’s the link Thank you! I kept chanting this to myself with much excitement when I heard that Cook Taste Eat in partnership with Whole Foods Market NorCal called for all food bloggers to come up with an appetizer or dessert using 365 Everyday Value coconut milk. 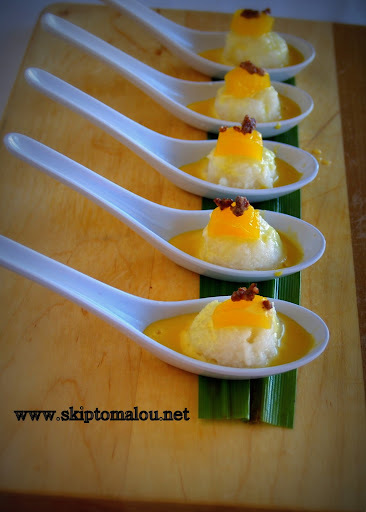 In my cooking classes, my students most enjoyed my sticky rice and mango recipe. However, for today’s recipe I elevated the taste even more by adding the silky coconut creme anglaise and also bourbon-smoked sugar as suggested by two lovely ladies whom I met in one of my classes. Indeed, this dessert has evolved from a simple homemade merienda to a fresh amped-up dessert. I used coconut milk in every layer of this dessert. It is a delightful trifecta of coconut flavors: the soft and creamy coconut rice is brightened by the coconut creme anglaise, and the surprise crunch of the coconut crumbs tops it all off! Ahhh – this is definitely coco loco heaven! Soak the rice with water for 20 minutes. In a pan, pour the rice amd water, then add 2 more cups of water and 1 can of coconut milk, sugar and salt. Add the pandan leaves. Bring it to a boil while stirring continuously to make sure that the rice won't get stuck at the bottom of the pan. When the rice is cooked and the texture is almost dry, add 3/4 can of coconut milk. Mix well and let it sit in the oven for 10 minutes. Make sure that the rice is cooked but not mushy. Discard pandan leaves. Let it cool. In a saucepan, pour the condensed milk, whipping cream and coconut milk together. Bring the mixture to simmer. Add lemon zest. Set aside. Whisk the egg yolks together. Now slowly add the warm milk mixture. Make sure to continuously stir the mixture as you pour. Scrape the mixture back into the saucepan and cook under medium heat. Continue to stir as you cook until the custard thickens. Add more lemon zest when the custard has cooled down. Set aside. Meanwhile, let's make the latik. (coconut crumbs). Latik is the residue formed from the reduction of coconut milk. Just pour a whole can of coconut milk in a thick saucepan. Bring it to boil and continue to stir until it has been reduced to almost no liquid at all. The milk will begin to change its color to slight brown and begin to solidify. Continue to cook until a little bit crunchy. Add the bourbon smoke sugar and stir. Set aside for garnish. This is the only Filipino entry in the contest so cast your Filipino VOTE now. Voting is til March 7, 2013. Here’s the link Thank you! Slice the sticky rice into bite size servings. 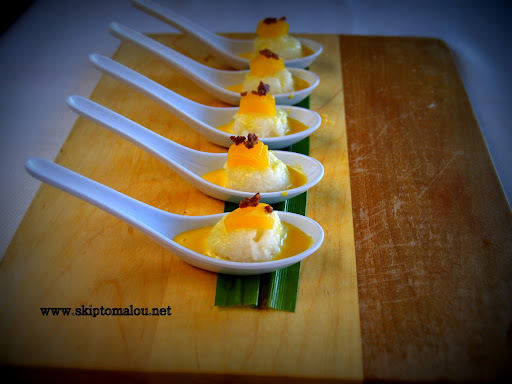 Top with mango, drizzle some custard sauce and sprinkle coconut crumbs….Check out the original post here. ENJOY!